While all dogs are loyal, loving, and oh-so cute, they aren’t all the same. Canines come in a variety of different sizes, and their size plays a key role in the type of care that they require. The biggest way that the size of a dog impacts the care that human’s best friend differs is in terms of nutrition. As a pet parent, you know that feeding your furry friend a well-balanced diet is essential. But what many pet parents fail to realize is that not all dog food is created equal. There are so many different formulas and flavors available, and while the objective of each type is to nourish and energize a pooch, recipes can vary significantly; particularly in regard to the calorie content and the ingredients that they feature. That’s why it’s important that you take the size of your pooch into consideration when you are selecting a food to feed him. If you want to ensure that your small breed is receiving the best possible nutrition, feeding him a dog that is specifically formulated for small dogs is vital to his overall health and well being. But, with so many dog food brands and formulas on the market, how do you know which option is the best for your petite furry friend? We’ve taken the liberty of selecting what we consider to be the best small breed dog food to help you make the right choice for your four-legged family member so that you can ensure his unique nutritional needs are being met. Why Do Small Breeds Require Specialized Diet? Now that you’ve had a look at our top five picks for the best dog food for small dogs, let’s examine each option a little bit closer. Below, we offer a detailed review of each of these five formulas, which includes an analysis of the ingredients, why we think they are the best, and what fellow owners of small breed dogs who use these products had to say about them. After you have read through the reviews and decided which option will best meet the dietary needs of your pooch, click on the buttons to find the best prices currently available on Chewy and Amazon. Of all the pet food companies on the market, Blue Buffalo is one of the best-known and most highly regarded. That’s because this US-based family-owned and operated company fully understands the nutritional needs of pups and creates a variety of formulas to make sure that those nutritional needs are being met. Their Life Protection Formula Natural Adult Small Breed Dry Dog Food is made of premium quality, all natural ingredients that have been hand-selected specifically for small breed dogs. The protein and carbohydrate content is higher than other Blue Buffalo formulas, so it offers the nutrition that petite canines need to thrive. Like all Blue Buffalo dog food, this formula features real meat as the first ingredient to ensure that your furry pal receives a healthy dose of protein. In this recipe, the protein is sourced from deboned chicken. It also contains wholesome whole grains, like brown rice, oatmeal, and barley, so it’s easy for those tiny tummies to digest. A variety of healthful fresh fruits and vegetables, such as carrots, sweet potatoes, peas, tomato, potatoes, blueberries, and cranberries, are also added to the mix. To further ensure your pet receives optimal nutrition, this formula is infused with essential nutrients that petite dogs need to thrive. It also contains glucosamine to strengthen the muscles and joints, which is particularly important for small breeds, as they tend to be prone to joint issues like hip dysplasia. This recipe contains Blue’s exclusive Life Source Bits, which contain a precise blend of antioxidants, vitamins, and minerals to further promote health. And, since it’s completely free of corn, wheat, and soy, it’s considered a grain free dog food, which is ideal for pets that are sensitive to these ingredients. 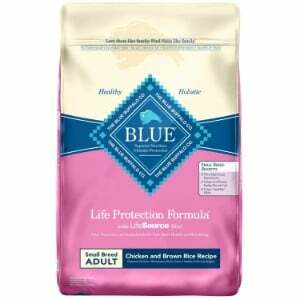 Final Verdict: Blue Buffalo Life Protection Formula Natural Adult Small Breed Dry Dog Food is formulated specifically for small breeds. It’s made with premium quality ingredients and offer the essential nutrients that petite sized dogs require. Pet parents have been relying on Purina dog food to nourish the canine companions for decades. Purina is one of the most recognized pet food manufacturers, and they are highly regarded for offering a variety of formulas that are made to meet the unique nutritional needs of all types of pups. Their Pro Plan Savor Shredded Blend Small Breed Formula Adult Dry Dog Food, as the name suggests, is made specifically for adult small breed pups. This dry dog food features real chicken as the first ingredient for the right balance of protein that your tiny pooch needs to support the health of his musculoskeletal system. It also contains naturally sourced glucosamine, which further strengthens his muscles and joints. Easy to digest brewers rice and whole grain wheat are great for those tiny stomachs, and the infusion of essential vitamin and mineral supplements, like vitamin B12, vitamin D3, calcium, vitamin A, and vitamin K, will help to maintain the overall health of your furry friend. The kibble is smaller, too, which makes it easier for the petite mouths of small breed dogs to consume, and shredded, meaty bits are mixed in to make the food more palate pleasing. Most pet parents who use this formula say that their dogs’ love the flavor and that they are very happy with the nutrition that it provides. 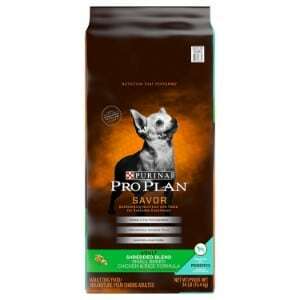 Final Verdict: Your small breed dogs will love the texture and taste of Purina Pro Plan Savor Shredded Blend Small Breed Formula Adult Dry Dog Food. You’ll love that it offers the vital nutrition that he needs to maintain a healthy and active lifestyle. If your small breed pooch suffers from tummy troubles or has sensitive skin, feeding him a dog food for sensitive stomachs and skin can help to alleviate his symptoms and improve his overall well being. Hill’s Science Diet dog food is highly regarded for their use of premium ingredients and because they create a variety of formulas to meet the needs of all dogs. Their Sensitive Stomach and Skin Dog Food is a great choice for adult small breed dogs that have tummy and/or skin problems. Featuring prebiotic fiber, which is sourced from beet pulp, this food will help to maintain the balance of healthy gut flora in your furry friend’s digestive tract and easy any stomach issues that he may be experiencing. It also contains nutrients that nourish the skin and coat, like omega 6 fatty acids and vitamin E. To strengthen the immune system of small breed dogs, this formula also contains vitamin C so that your pooch will be ready to take on any infection that might come his way. To further improve your small pal’s tummy troubles, this recipe features easy to digest carbohydrates, like brewers rice and cracked pearl barley, which will also offer him the energy he needs for his active life style. Made with no artificial flavors, colors, or preservatives, you can rest assured that your small pooch will receive the very best nutrition when you feed him this formula. 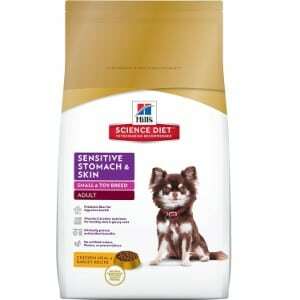 Final Verdict: For a healthy, well-balanced diet that supports digestive health and skin health, Hill’s Science Diet Adult Sensitive Stomach and Skin Dog Food is an excellent option. It will help to improve your pooch’s digestion and clear up any skin issues that he may be having. If you discovered that your small pooch requires a grain free, high protein dog food, you’re going to want to ensure that you choose a formula that uses protein sourced from real animals and doesn’t contain any hidden grains in the recipe. 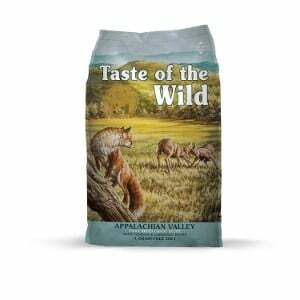 You can count on Taste of the Wild dog food, a US-based, family owned company, to provide your pup with high quality ingredients to suit his dietary needs. The Taste of the Wild Grain Free High Protein Dry Dog Food is made for small breed dogs that need a little more protein in their diets but can’t tolerate grains like corn, wheat, and soy. The first ingredient used in this formula is meat sourced from real venison, so you can be sure that your pooch get the amino acids that he needs to support the development of his lean muscle mass and promote healthier joints. It also contains natural sources of carbohydrates that are easy to digest, such as sweet potatoes, potatoes, and peas. Other ingredients include blueberries, raspberries, and several other superfoods that have a high antioxidant profile to strengthen the health of your dog’s coat, skin, and immune system. Most pet owners say that their dogs love the taste and that they are very happy with the nutritional content of this food. Final Verdict: Taste of the Wild Grain Free High Protein Dry Dog Food is completely free of grains, so it’s easy to digest, and offers a high protein content that your small dog needs to thrive. Made with premium quality ingredients and featuring a wealth of nutrients, your pup will love the flavor and you’ll love how it nourishes your pooch. 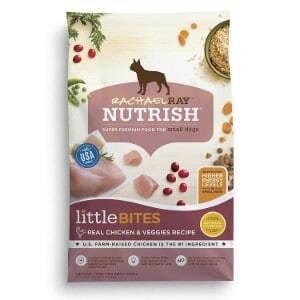 Last, but certainly not least, on our list of the top dogs food for small dogs, is a Rachel Ray Nutrish dog food formula. Made specifically for small pups, like Toy Poodles and Rater Terriers, this dry dog food contains the vitamins, minerals, and nutrients that petite canines need to thrive. The kibble is also smaller for those tiny mouths. Featuring real animal protein as the first ingredient, which is sourced from premium quality chicken, this formula offers the protein content that smaller dogs need to support healthy muscles and joints. It also contains cranberries, which are right in antioxidants and can help to reduce the damage caused by free radicals that have been proven to cause a variety of health issues, as well as peas, carrots, brown rice, and dried beet pulp. The infusion of essential nutrients, like vitamin B12, calcium, copper, and folic acid, will further support your pooch’s overall health. Most pet parents are very happy with this product and say that their dogs seem to love the taste. Final Verdict: For pet parents that are looking for a premium quality dry dog food for their petite pups, Rachel Ray Nutrish Natural Dry Dog Food will be sure to please. Specifically formulated to nourish small pups and made with natural ingredients, this formula will keep your pup happy and satisfied. When it comes to caring for your four-legged family member, your job, as a pet parent, is to choose the very best products that will meet his needs. With high quality products, you can ensure that your furry pal lives a happy, healthy life. While certainly, things like a dog collar, a dog crate, and a dog bed are extremely important, the type of food you put in his dog bowl is the most important. Your pooch needs to be fed a premium quality food that offers the vitamins, minerals, and nutrients that he needs to thrive. If you have small breed dog, his nutritional needs are much different than a medium or large breed dog, which is why feeding him a dog food that is specifically formulated for small canines is essential. But why do small dogs require different food? How can you be sure that the food you are feeding your petite pooch will meet his needs? In this portion of our review, we’ll answer these questions and more. Small dogs, like Bichon Frises, Dachshunds, Pugs, and Chihuahuas, need a lot less calories than larger breeds, like Cane Corsos, Mastiffs, and Rhodesian Ridgebacks. With that said, if you feed your small pooch just any type of food, such as a food for large dogs, even if you feed him much less than you would a large dog, he might taking in way too many calories. Just like humans, when canines consume too many calories, they can put on excessive weight. Also like humans, overweight dogs are more prone to a variety of health conditions; cardiovascular disease, diabetes, and joint issues, for example. Additionally, small dogs generally require more protein than large dogs to ensure their delicate muscles and joints are well nourished. They also need more carbohydrates than their large breed counterparts to offer them the fuel they need to support their higher energy levels. For these reasons, it’s essential for pet parents to feed their small canine companions food that is specially formulated for their size. By doing so, your pup will get the vital nutrients that he needs to thrive. High protein. As mentioned, petite breeds require more protein than medium and large breed dogs. This nutrient is the building block of healthy muscles and can help to stave off joint health issues, like elbow and hip dysplasia; conditions that are very common among small pups. Make sure the formula you select has a high protein content, and that the protein is sourced from real animals. High Carbohydrates. Petite pooches have higher energy levels than larger dogs. Carbohydrates are turned into energy, so ensure that the recipe you choose for your pooch has a high content of premium quality carbohydrates; sweet potatoes, potatoes, and peas, for example. Smaller kibble. If you are feeding your canine companion dry dog food, look for a small-sized kibble. Obviously, smaller kibble is easier for those tiny mouths to tackle than large kibble. Essential nutrients. Make sure that the food you select is formulated with essential vitamins, minerals, and nutrients that will support the overall health and well being of your small pooch. For example, glucosamine will promote stronger muscles and joints, vitamin E will nourish his skin and coat, and prebiotics will keep healthy gut flora in-check and maintain proper digestion. In order to choose the best small breed dog food formulas, first, we considered the needs of smaller sized canines (which we mentioned above). We assembled a team of experts, which included veterinarians and animal nutritionists. These experts helped us assess the ingredients of various types of dog food formulas to ensure that they offered a well-balanced nutritional profile that would support the needs of small pups. We also read through dozens of dog food reviews. Based on the information that we acquired, we were able to narrow down the options to the five formulas featured in our review. The nutritional needs of small canines are much different than larger dogs. That’s why it’s important to make sure you are feeding your small breed four-legged family member a high quality formula that contains ingredients that will properly nourish him. All of the dog food recipes that are featured in this list offer premium quality ingredients and are specifically formulated for small pooches. If, however, you choose a different formula, make sure that you do your due diligence and read the ingredient list to ensure that it offers the nutrients that your petite furry pal needs to thrive.